Are you trying to increase the reach of your brand with online video or live streaming, but unsure how to professionally present and produce them? Are you trying to promote your products and services to camera but lack professional knowledge of how to present yourself as an expert? Would you like to know how to endorse and effectively “sell” your product and service when being interviewed on camera? Would you like to know best practices when presenting to camera; particularly live video streaming? If you answered YES to any of the above, this three day training course is for you! Please note this course cannot be booked until completion of 'The Novice' training. Should you wish to book both at once a special offer will be given during the booking process. The next level course in our speaker training series is ‘Sensational Selling’. This is a three day presentation skills workshop where you will progress from a novice to a professional level of on-screen presenting skill. We also teach you how to explode your sales and gain followers by developing an authentic on-screen presence that speaks to the needs of your audience. Our team of Celebrity Experts and coaches have years of experience promoting and endorsing products on camera, and will personally coach you on time tested methods top sellers like themselves have used to gain continued results. Our ‘Sensational Selling’ course is beyond The Novice level. We pride ourselves on our vast experience, and only work with like-minded professionals that are serious about building their brands through the power of online video media. Each module is covered through personal one-on-one instruction from our team of Celebrity Experts that will review and coach you every step of the way. The atmosphere is casual, but intensive. You will get the opportunity to train within a real TV studio and we will conclude our hard work with a certificate ceremony and screening! What are you waiting for? Spaces on our courses are limited as we only take small groups, so reserve your place today. Improve your speaking skills and maximise your ability to present and sell your services on camera. Understanding how to fully utilise the power of video is priceless, and this course will be the beginning of bigger things for you and your business! Receive 10% off the full price when you book The Novice and The Professional presentation training courses at one time! Email us for further details. For a limited time, when you sign up for ‘The Professional: Sensational Selling’ 3 day course you will receive your personal raw footage filmed during the course as part of your enrolment. This service is usually subject to an additional fee starting from £450. For a limited time as a special bonus for booking this course we are also including a VIP PASS for you and a friend to one of our quarterly “Cameras & Cocktails Celebrity Summit” events. Put years of award-winning mainstream broadcasting experience in your corner. 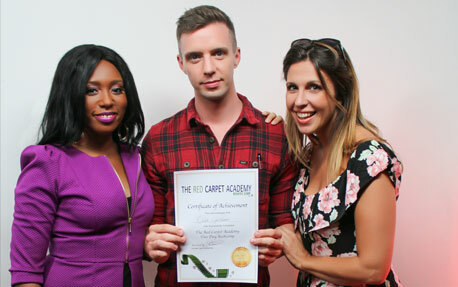 From entrepreneurs to public speakers and professional coaches, The Red Carpet Academy provides high quality and unique media training and camera presence skills that will lead you to success.